Located in the far southeastern tip of Uganda, Mgahinga Gorilla National Park is located in the Virunga Mountains, and is connected to Volcanoes National Park in Rwanda and Virunga National Park in the Democratic Republic of Congo. The park was designated a UNESCO World Heritage Site in 2007. 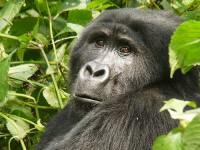 Along with Bwindi, Mgahinga is one of two national parks in Uganda where tourists can go gorilla-trekking. However, the park has only one group of gorillas, which can only be seen when they are in Ugandan territory, making it somewhat unreliable. There are plenty of other animals to spot though, including golden cats, bushbuck jackals, duiker, rare golden monkeys, elephant and buffalo. Aside from its wildlife, the breathtaking scenery of Mgahinga Gorilla National Park is brooding and mysterious, with jagged volcanoes and stunning valleys.